Gibbons Welcome to Gibbons, located just north of Edmonton at the junctions of Highway 28 and 28A. Settled in 1895 by W.R. Gibbons and family, this community, situated on the edge of the Sturgeon River, became the first stop on the Athabasca Landing Trail. 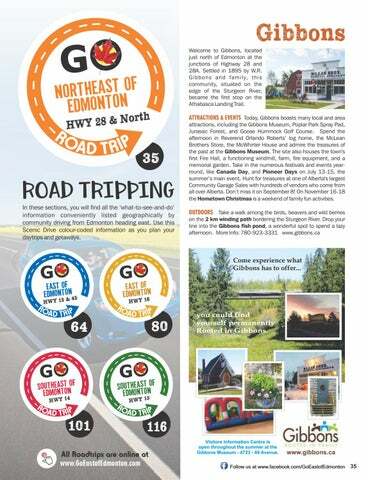 ROAD TRIPPING In these sections, you will find all the ‘what-to-see-and-do’ information conveniently listed geographically by community driving from Edmonton heading east. Use this Scenic Drive colour-coded information as you plan your daytrips and getaways. you could find yourself permanently Rooted in Gibbons. Visitors Information Centre is open throughout the summer at the Gibbons Museum - 4723 - 48 Avenue.